I haven't made this one yet, but I thought it looked pretty yummy. Looking for a creative way to use leftover chicken? These kicked-up, easy-to-prepare enchiladas come out of the oven hot and bubbly for a flavorful dish the whole family will love. Heat the oven to 350°F. Stir the soup, sour cream, picante sauce and chili powder in a medium bowl. Stir 1 cup soup mixture, chicken and cheese in a large bowl. 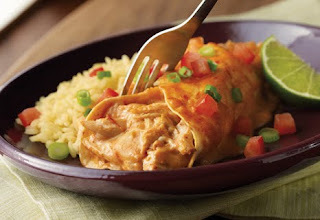 Divide the chicken mixture among the tortillas. Roll up the tortillas and place seam-side up in a 2-quart shallow baking dish. Pour the remaining soup mixture over the filled tortillas. Cover the baking dish. Bake for 40 minutes or until the enchiladas are hot and bubbling. Top with the tomato and onion. Ingredient Note: Stir 1/2 cup canned black beans, drained and rinsed, into the chicken mixture before filling the tortillas, if desired. Easy Substitution: Substitute 3 cans (4.5 ounces each) Swanson® Premium White Chunk Chicken Breast in Water, drained, for the cooked chicken. Serving Suggestion: Serve with iceberg salad mixed with carrots and red cabbage and a red wine vinaigrette. For dessert serve prepared refrigerated flan.